Edinburgh, UK is Scotland’s compact, hilly capital. Edinburgh’s Old and New Towns, divided by the broad Princes Street Gardens, were listed as a UNESCO World Heritage Site in 1995 in recognition of the unique character of the Old Town with its medieval street layout and the planned Georgian New Town, including the adjoining Dean Village and Calton Hill areas. There are over 4,500 listed buildings within the city. The Old Town runs downhill and terminates at Holyrood Palace. Minor streets (called closes or wynds) lie on either side of the main spine forming a herringbone pattern The West End includes the financial district, and the Edinburgh International Conference Centre. Looming over the city is Edinburgh Castle, home to Scotland’s crown jewels and the Stone of Destiny, used in the coronation of Scottish rulers. Arthur’s Seat is an imposing peak in Holyrood Park with sweeping views, and Calton Hill is topped with monuments and memorials. For runners, it’s possible to see many of the city’s historical and architectural highlights within a 4-5 mile tour. 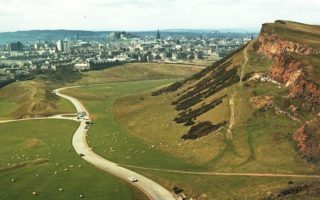 The running highlight is a tour of Arthur’s Seat (Holyrood Park), and for those who like hills, the run up to Calton Hill and the Edinburgh Castle. Water of Leith is a lovely canal side run, providing an opportunity to rack up the miles. The sea is 5km to the east, where there’s good beach side running in Portobello. 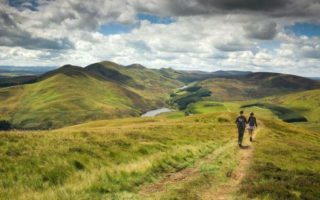 Slightly further afield, head to the Pentland Hills, where wonderful, open trails head up hills, through meadows, farms, and fields, and along reservoirs. Buses are the main form of transport within Edinburgh, mainly operated by Lothian Buses. Rail serves suburbs and other parts of Scotland. 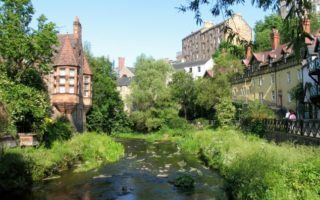 A 4 mile 'runseeing' tour of Edinburgh's highlights. Start at Regent Gardens, head up Carlton Hill, then through Princess Gardens up to Castle Rock. The second half features High St./Royal Mile to the Holyrood Palace. It's a hilly run! A "Highlands" experience a mile from Old Town Edinburgh, this run is a circuit of Holyrood Park. Open spaces, parkland, crags, and the imposing Arthurs Seat, the main mountain in Edinburgh. The route also features sections of Old Town. Large public park just south of the city center. Wonderful open meadows with about 1.5 miles of paths. Can add another 1/2 mile with adjoining Bruntsfield Links. Canal-side path that goes about 12 miles between Leith and Balerno. Leith is on the water, about 2 miles north of Edinburgh. Closest pass to central Edinburgh is Royal Botanic Garden. We've included a table with distances between major way points. 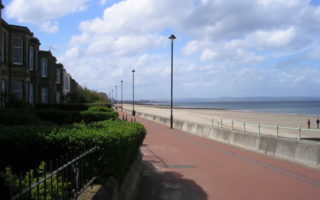 Nearly 2-mile promenade along the beach, in this suburb 3 miles from Edinburgh city center. The beach is good for running as well. 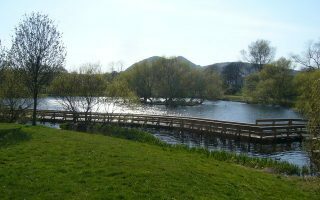 A 4-mile pedestrian from the south side of Holyrood Park, to Portobello, through Duddingston Loch. 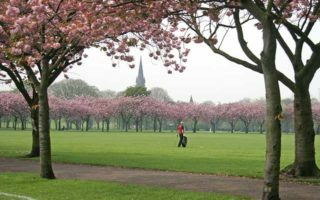 A great standalone run, or can be combined with Holyrood Park, Portobello, and other routes. Trail running heaven only 6 miles from Edinburgh. 100km of waymarked trails through meadows, farms, up and down hills, and along reservoirs. Several, moderate 'circular routes', and a challenging 7-mile loop recommended by Edinburgh Run Tours. A fun spot for trail running 7 miles south of Edinburgh. 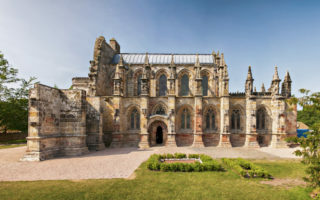 Enjoy this lovely village, old inn, and Rosslyn Chapel, made famous by the DaVinci Code. The area is a gateway to Pentland Hills Regional Park, with 100 km of trails. 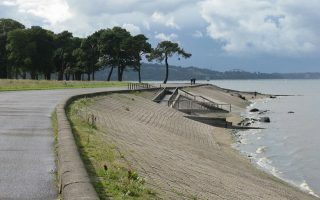 This Parkrun utilizes the long tarmac footpath along the Cramond/Silverknowes Promenade. 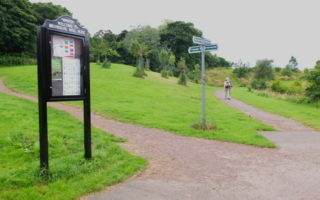 Nestled into Portobello in the east of Edinburgh, Figgate Park consists of a series of concrete paths running along the long Figgate Burn. Edinburgh’s climate is synonymous with its landscape. Bring your cool, wet weather gear. Summers are mild and rarely hot. 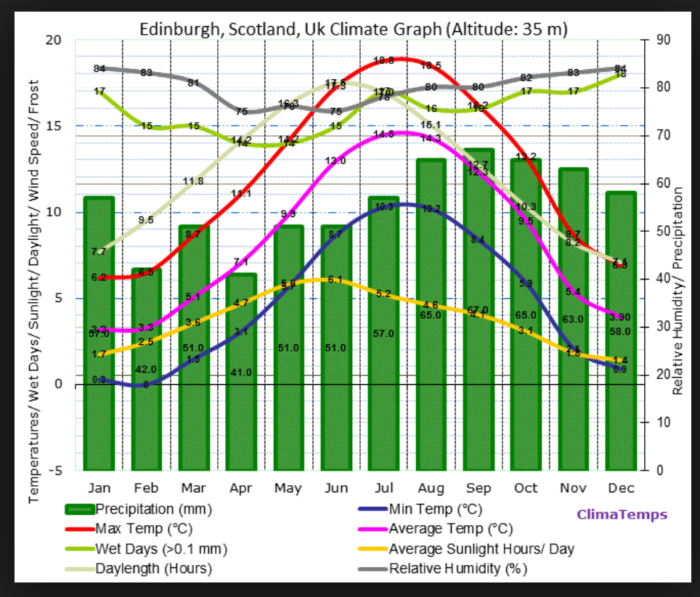 Average high temps in summer are on the mid 60s (19C), and nights are cool, dropping to about 50F (10C). Winters are damp, where the air feels colder than temps that average in the mid-40s (6C) in January, with average lows right around freezing. Snowfall is occasional. There’s not a lot of sunshine – some 2/3 of days in most season have precipitation, though average rainfall is only 26 inches — less than New York or Boston. Two other noteworthy features are frequent wind, and the variation in day length, from a scant 7 hours in December to 16 hours in July. Enjoy those summertime late evening runs! 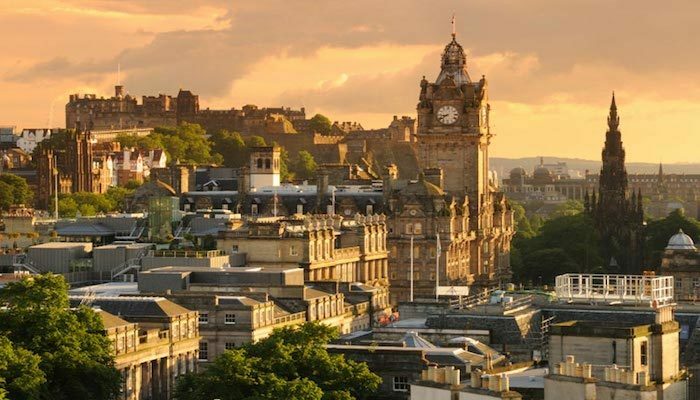 There’s a good selection of hotels in the center of Edinburgh, in both Old Town and New Town. Most are centrally located and are near the routes we’ve suggested for the city. There’s a cluster of hotels near Holyrood Park, which is great for running. 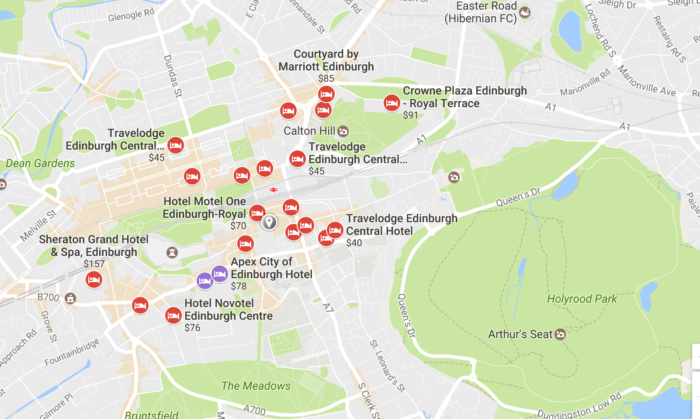 There are also hotels near Regent Gardens and Princes Street Gardens at the foot of Edinburgh Castle. There are a couple of good indy running stores in Edinburgh. Run and Become. Good running store in New Town, near Princes Street Gardens. Lots of in-store events, here. Run 4 It. Good store in arts district near the Castle area. Small chain with several other stores in Scotland. Their web site has a great list of running clubs in the area. Group Runs from their store Mondays 6pm. 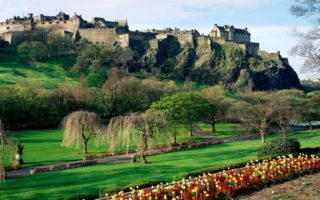 We recommend Edinburgh Run Tours, which offers wonderful guided runs of Edinburgh and surrounding areas. We also recommend Run the Sights, which offers wonderful guided tours of Edinburgh (as well as Glasgow and Dundee). RunABC Scotland has a good list of races in Scotland.